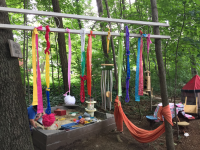 After meeting Tobey Eugenio at Hidden Hollow, Sandwich, MA, a journey of several years took place creating our outdoor classroom space. Our original intention was to integrate outdoor classroom areas in our traditional playground. Staff took a workshop with Tobey and visited Hidden Hollow. Our first summer attempt in 2012 gave the staff a real taste of outdoor living and learning. The school year began and we continued to develop our programs. A series of garden beds were built and gardening was incorporated into the program. In 2014 Temple Israel synagogue and I entered into an agreement about the use of some space on Temple property. 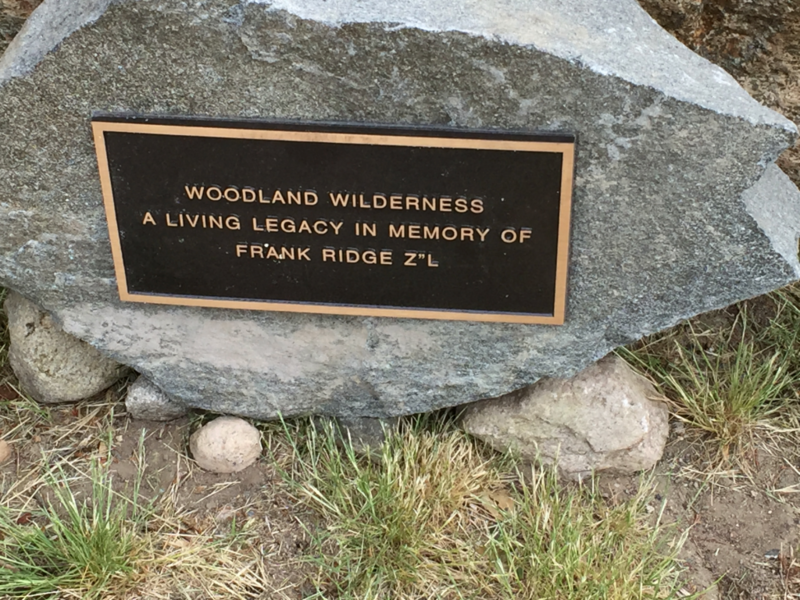 After accepting my proposal, Woodland Wilderness was created in memory of my father, Frank Ridge, to honor his love of the outdoors and adventure. My father’s great grandchildren were included in the dedication (June 2015). Izzabel and Paxton represent the joy and pleasure of nature play. They have recently been joined by their new brother, Remington Ridge Kritz. I look forward to Remme enjoying the space with his siblings. I donated the initial start up funds necessary to facilitate the space. Hertz Nursery School also contributed in my honor of being with the school for 25 years. 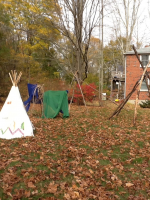 Through donations and current synagogue budget Woodland Wilderness continues to grow. We started by clearing a large field area. A fence was put up to separate the field from the street and a performance stage put in this area. Next to the parking area a wooded tract of land was carved out with rustic paths to lead to the various interest areas. The field is connected to the interest areas with a river rock path and bridge. From the parking lot you enter Woodland Wilderness via a brick paved path that has engraved stones that honor Lisa Kritz. At the time Lisa had served as director for over 25 years. There is a sign that hangs between two trees and antique shutters adorn each tree. The shutters are used for hosting information about activities that can be done in the interest areas. They appear on laminated cards and are attached by clothes pin. This encourages families to use the space on their own. There is no fee or membership for using Woodland Wilderness, although you must be a member of the school or synagogue community.